Home » Frugal Living » Health and Beauty » Tattoo removal on the cheap...just use a Black & Decker Sander. This one takes the cake. I've heard of cheap, home solutions to possible expensive cosmetic procedures, but isn't this going a little too far? It's certainly not for the squeamish or people of a sensitive disposition. Please note. I'm not endorsing this, just as I wouldn't endorse using acid to remove a tattoo, or swallowing a tapeworm to achieve cheap and easy weight loss. As a frugal reporter on the front line of the money-saving war, some things just have to be reported. Photo by The Stock Exchange . Video by some seriously screwed-up folks. Their time would have been better spent if he had just sanded that guy's face off. What a bunch of dummies. That's the tattoo I'm going to get to cover up the one I have right now. Instead of giving everyone fingerguns, I can just expose my belly. Wow, I just really disturbed myself with that imagery. Wow that looked painful....I have done 4 treatments of laser tattoo removal and I have to say it was worth it to me, although it may not be to someone else. I have one left and I am going to see someone about the acid treatment next week, why the huge negative towards that treatment??? This is either a spoof (most likely, otherwise that clown would be writhing in pain), or these guys are a bunch of retards. The pigment is in the subcutaneous tissue. If you sand down into the subq, you trade a giant ugly scar for a tatoo. man that was freakin crazy but it probly works DOES IT??????? TELL US?? im going to do it. I hope that guy enjoys looking like a skin graft recipient for the rest of his life. well yes it will leave a huge scar and i am curious if this is staged? because the guy didnt show and inch of pain but he could be high on something or using novicaine, but the reality is if you are trying to enlist or withhold a job a scar is better then a tattoo because its simply not a tattoo. so in a sense it works as a one time method, but you also have to explain how you got the scar and if you explain this process you will probably be admitted. yes im trying to get my tatts beind my ears removed! other wise i cant get accepted in to the army! I was eighteen. I had just joined the Navy///” everyone was doing it”/// It was small, about 2 inches by 2 inches. What could it hurt????? That was in 1952, and I have hated it for 57 years.Don,t bother with the math, I'm 75. I have tried burning it off a little bit at a time over the yearswith a soldering tool, with little success and a lot of small scars and some pain. Recently while working with my Dremel tool in my little shop, I thought I would try again to remove my tattoo. I searched my first aid kit and found a packet of antibiotic ointment. I had a new stainless steel brush, which I soaked in alcohol overnight. The next morning I was in the tattoo removal business. I was at a little disadvantage because my tattoo is on my right forearm and I am right handed. A few small touches to test my resolve set me at ease because I did not want a large wound. The almost invisible little slits began to show red oozing into the heavy coat of ointment. I felt no pain, so I continued until I had lightly covered the entire tattoo. After cleaning up the ointment, I put some on a band aid covered it and hoped for the best. I am a curious sort and I wanted to see what I had accomplished and about an hour later with the bandage removed, there was no bleeding just a lot of little red nicks.Muich like razor cuts, but much smaller. After about a week, the wounds were all healed and the markings about ¼ gone. And as a bonus the self inflicted scars were gone also. The second attempt went like the first and now my tat is just a blur. this morning it got another treatment , but this time I didn’t have to cover as much area because some of it is completely gone already. So far the blood which I have lost would not not even soak a Q tip. I am sorry, Ididn't mention that I am using the rotary carving tool with the stainless steel brush at high speed.the brush cost less than $3.00 The ointment about the same the pain envolved is less than shaving a stiff beard.. I do not have an original picture before I started, but I do have a couple of pictures taken recently and will be sent on request. To see the step by step process of my DIY tattoo removal. There was no expenses because I had everything that I needed in my shop. That is crazy,i want my tattoo gone but i dont see myself doing that!I would rather use tattoo cream and just fade it til its gone.Im only 21 i got plenty years left to work on it. Shortly before I was married, my husband and I got drunk and got our names tattooed on each other. When things went south, I wanted to get mine removed, but couldn't afford the treatments. The name was in the small of my lower back, all black and was really small about 1.5"H x 3.5"L. I read on the internet that I could remove it using a cloth dipped in hot water and then in sea salt. I did it cold turkey. Nothing to ease the pain. I kind of looked over my shoulder into a mirror and began scrubbing. The salt made the wound feel hot- but not terribly painful despite the amount of blood. I did about ten two minute scrubbing sessions being careful not to scrub too deeply- just enough to make it bleed- and then bandaged it up with Neosporin. I kept changing the bandages and on the second day, the bandage had traces of the ink on it. It took a full two weeks to heal, but the tattoo faded significantly and continues to fade as time goes by. There is no scarring. I know this process would have removed the entire thing if I ever did it again... but we reconciled and he doesn't want me to finish the removal. I would suggest it to anyone. Does this really work? I'm 20 & I am trying to get into the Air Force & my wrist tattoo is prohibited & possibly my ankle one. They are both really small & if I have any chance to remove them safely & quickly, I am going to try. Is it safe? I don't want to be unable to be turneed way because of something I did when I was 18. They are both blackish & The star is just an outline, it's not big at all & kind of crappy looking & my ankle one is small to. Thanks. Man, thats really taking it to the next level! Probably need a couple of shots of the strong stuff before you try that out. I've been looking for some at home tattoo removal cream. There's a lot out there and none of them are really cheap. Has anyone ever heard of TAT-Med? It looks like a complete scam. They've made a website called the Skin Health Association thats supposed to look unbiased and compare different fade away creams, but theres too much propaganda about themselves for it to be a real website. Of course, they rate themselves number one but their product doesn't even sound real when you read the ingredients list. Have a look for yourselves and let me know what you guys think. I think those natural acids that are in that stuff might actually work but i'm gonna try that it's too much money. I ordered some 100% Trichloroacetic acid. It needs to be diluted. It was like $16 with shipping. I'm trying out that acid i put it on my arm about a week and 1/2 ago...it doesn't look like it's fading right now, but the skin is discolored and some of it's flaking off. I think it takes like a year and you gotta keep re-applying it every month. I'll let you know if it starts fading or something. I'm on my like 2'nd month/ application of this acid stuff. It's not fading yet but the skin peeled and healed. I reapplied. Really freaking itches this time. so far,how is your tatoo status? im writing to you DRUNK. coarse salt and a hard bristled toothbrush removed one on my right forearm once. it was only small though. i can only imagine the type of infection this has created an opening for. I really don't recommending anything like this, becuase of the high chance of infection. 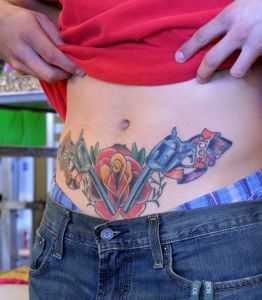 What I would suggest is a painless herbal removal remedy i heard using a combination of some herbs can break down the ink pigment, one of friend's friend removed her 2 inch tattoo using natural remedies, she siad she used http://GetRidTattoo.com system. Have to use on mine too, I want to get rid of that stupid popeye on my arm..